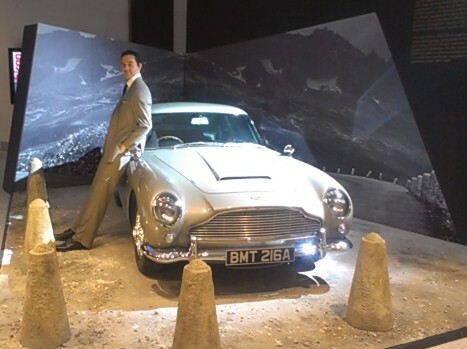 I went to the new Bond exhibition at the Barbican, Designing 007 – Fifty Years of Bond Style, last Friday. The exhibition is broken down across three physical areas of the Barbican and built up from thematic sections like gold, gadgets, casinos and travel. Each section is filled with a variety of props, costumes, concept art and models that anyone who ever saw the films will recognise. Alongside the exhibits giant stills, music and excerpts from the films playing to illustrate the theme. 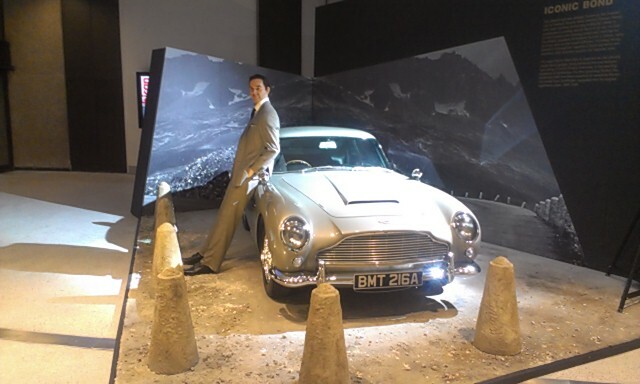 Outside the exhibition itself are a few bits of Bond paraphernalia worth looking at – a DB5 and a selection of the film posters. If you go take a minute to look at these if you come in through an entrance that doesn’t go past them. The first area is the largest and includes the gold, gadgets, casino and travel sections. A lot of thought has gone into this part of the exhibition with set dressing used to reinforce the theme. The gold room is reminiscent of Goldfinger and the gadgets are in a room full of packing cases accessed through industrial PVC strip curtains. The second area holds the Villains and Enigmas section. The arrangement of the cases is slightly unusual with floor to ceiling arranged at angles to each other forming an open grid. The arrangement is reminiscent of the mazes in some bond books and films. Each case has an illustrated back and holds costumes, concept art and paraphernalia for one or two villains or characters whose loyalty is more flexible. The third and final area is a room in the basement accessed by a lift dubbed the ice palace which holds exhibits relating to Bond’s chillier adventures. At its heart is a model of the ice palace from Die Another Day and around the walls are snowy scenes from several of the films. The first area is by far the strongest while the ice palace is the weakest. I can’t help wondering if thematically the final section being in the basement shouldn’t have been secret bases – pulling those mentioned in the travel section out to go down there – with snow in the travel section. With suitable set dressing basement rooms accessed via an elevator and a couple of appropriately dressed dummies of guards could have been quite a finish to the show. What the show has for the fan though is a huge selection of stuff from the films. I’m not a big fashion fan (it took me ten minutes to walk round the show of shoes at the Design Museum earlier in the week) but the costumes and recreations of costumes on show here are a real wow. Seeing the ideas boards that went into the conceptualization of the designs was a really interesting. The selection of props from weapons to personal effects to models of some of the vehicles is excellent. It was fascinating to see how some costumes and props that looked very real on film looked quite ordinary in person and others looked stunning. Seeing Sir Ken Adam’s original sketches for various set designs was as great a thrill as seeing Picasso’s work at the Tate. If you go and you’re time is limited linger in the first area saving the time it takes to do a section for the second area and unless the snow scenes are your favourite the least time for the third area. My biggest quibble is something the Barbican can easily fix: with the exhibition is spread across 3 areas of the venue clear signage is essential. The first two areas are obviously connected. However the final one is a little less obvious and a few strategically placed signs would help visitors unfamiliar with the building be sure they’re going in the right direction and getting into the correct lift since they don’t all go to the -2 Basement. Overall very enjoyable and I would recommend it to any fan of the films. I’m off to watch one of the films on DVD.